Below are screenshots and short a video explaining how you can set up and collect student responses from Google Drive into Schoology. For example, you may choose to "pass out" an assignment using Google Classroom, but use Schoology as the starting point for the students to access the assignment as well as the means of collecting the completed assignment. 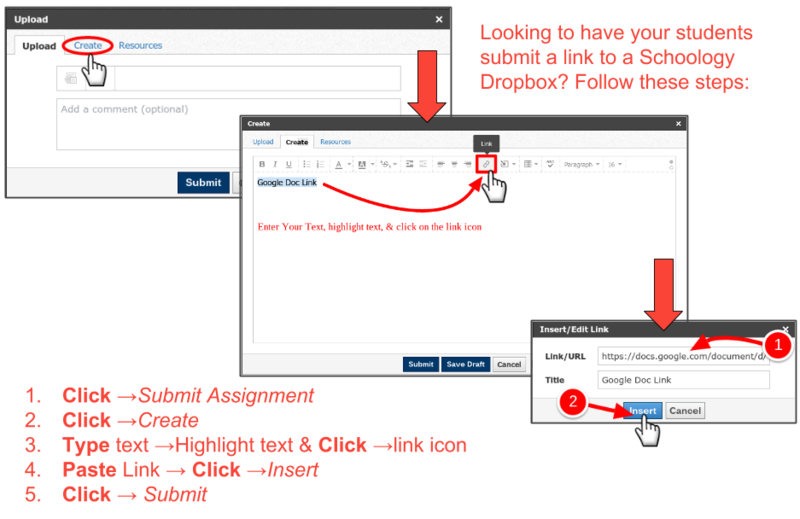 In order for students to turn in the link to their Google Drive assignment it is important that they share the editable link with you using the Create button option. This will create a blank Schoology page for them to paste in the link to their completed Google Drive assignment. *If students have connected the Drive App in Schoology they can also click on the "add content widget" --> Google Drive --> and Navigate to their file.